Photodynamic therapy (PDT) with 5-aminolevulinic acid (ALA) is a widely used, although off-label, treatment for moderate to severe acne in the USA. Still in its infancy, this treatment has confounded our better wisdom for best practices as studies have been limited and largely carried out in small, investigator-initiated clinical trials. Still, some consensus does emerge on the best light sources, incubation times, expected outcomes and long-term course. The most common light sources for this treatment are intense pulsed light (IPL), pulsed dye laser (PDL), blue light, and red light. 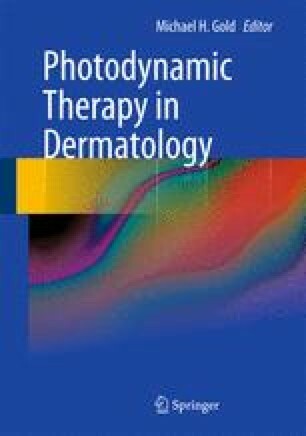 Most studies in the USA, although not controlled, randomized or blinded, indicate that IPL and PDL are more effective than blue light for acne, whereas red light with ALA has been little evaluated. This makes sense as the sebaceous gland (SG) is approximately 1 mm below the surface of the skin and the majority of blue light does not penetrate to that depth. Studies have supported that very short ALA incubation periods ranging from 15 to 30 min are effective for the treatment of acne. The author postulates that there is a follicular penetration that precedes transepidermal transit that accounts for the efficacy of short contact PDT. PDT for acne with 5-ALA for the treatment of moderate to severe acne is a very efficacious and safe procedure that is significantly underutilized in the USA due to lack of FDA approval and insurance reimbursement as well as some convenience factors. W. Mills, J. Adair, and E. Altinoglu, Novel approach to safe and highly efficient cancer imaging, SPIE Newsroom, 9 Feb 2009, http://dx.doi.org/10.1117/2.1200901.1459.